Fall is officially here and it brought the rain!! I always love the days of first fall rains here in PDX. But that joy slowly turns into a deep annoyance. I mean who can blame me? Don’t get me wrong- rain is awesome. It feeds the beautiful environment we have here and I appreciate it whole heartedly. HOWEVER, after 90 days of straight rain it dimply wears on me. But I digress…. We’ve had a pretty busy weekend so far but I carved out 15 minutes and quickly threw together some pizza dough. I didn’t have much of a plan, but I did grab pepperoni at Trader Joe’s when I dropped by earlier in the day. I also grabbed ricotta. I had no plan for it at the time but now I am SO GLAD I picked it up!! I forgot about the all veggie, no sauce, pizza I make. It’s a pretty simple prep of sautéed shallots, garlic, steamed broccoli and steamed spinach (squeezed dry). As for the ricotta, I used about half the container and quickly mixed in Romano cheese, salt, and pepper. Then I topped it all with shredded mozzarella. Let me tell you…. it is FABULOUS. And an important side note, it’s still delicious when reheated the next day!! One pizza dough, ready to bake & prepped on a pizza screen. 1. Preheat the oven to 500 degrees. 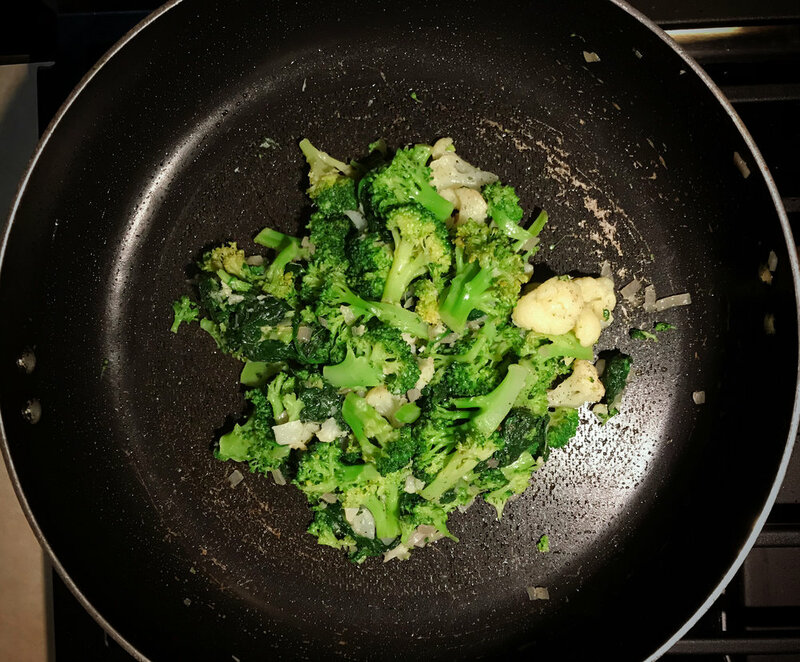 In a nonstick skillet, heat the olive oil on medium heat. Add shallot and sauté until it just begins to turn clear. 2. 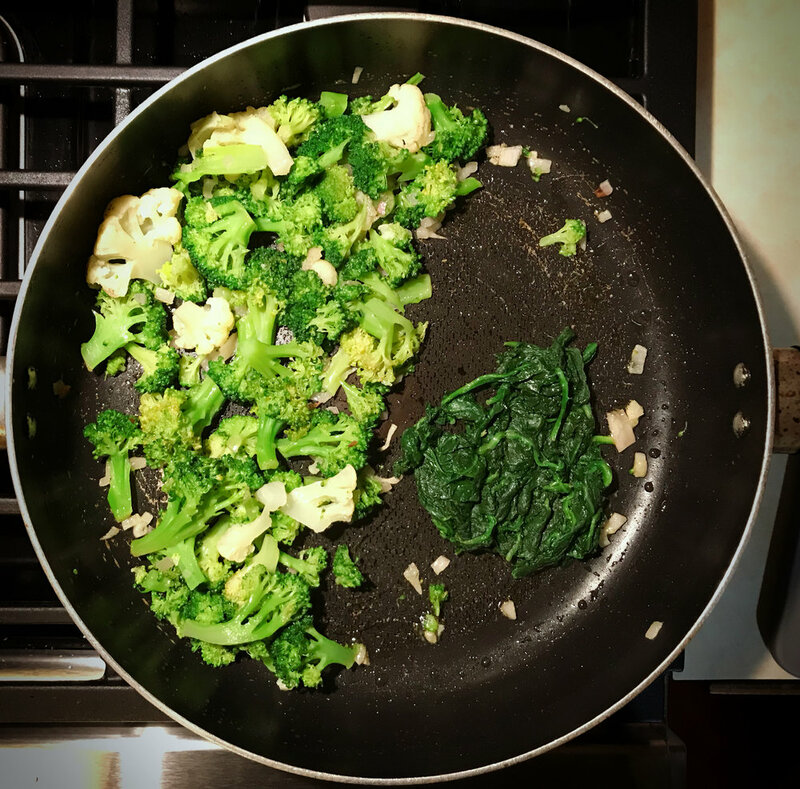 Add the broccoli, spinach, garlic and salt and pepper to taste. Sauté, on low, for a few minures. Set aside and let cool. 3. In a small bowl mix the ricotta and Romano cheese. Salt & pepper to taste. 4 On the prepared pizza dough, add one teaspoon of the ricotta mixture at a time to the dough. Arrange dollops evenly around the dough. 5. 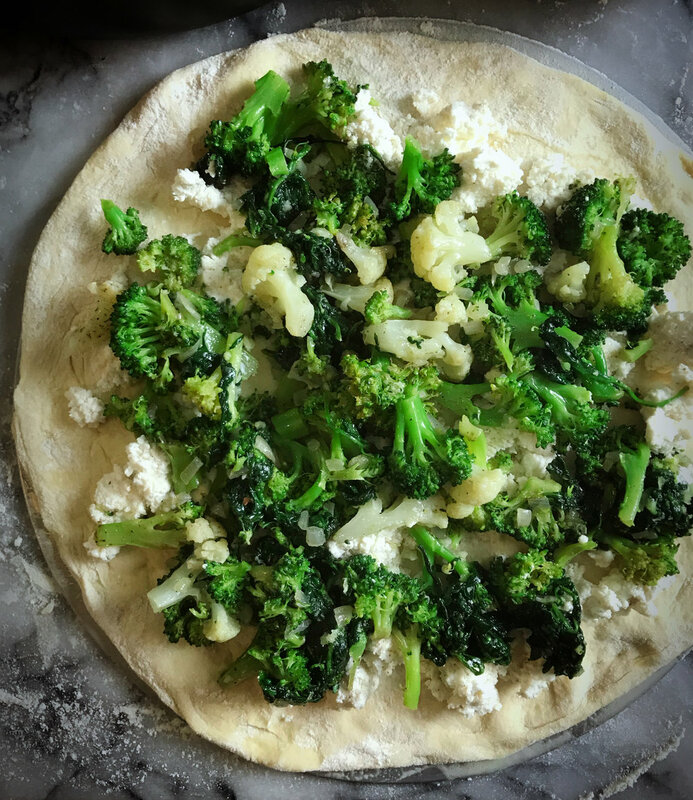 Evenly spread the broccoli mixture on top of the ricotta. Top with the shredded mozzarella cheese. Bake for 15-18 minutes.